Started to tick off places on our 30 Bars You Should Have Been To If You Live In Auckland list yet? Hopefully you’ve discovered some epic watering holes to try. Brace yourselves! For once again we’re bringing you an alcohol-related list that you’ll want to drink your way through. 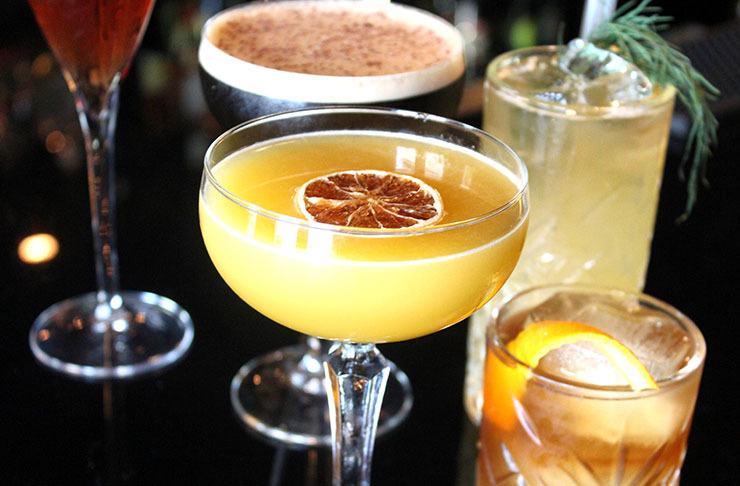 In no particular order (we don’t discriminate against beverages), here are Auckland’s best cocktails from some of Auckland’s best bars. Go forth and slurp. 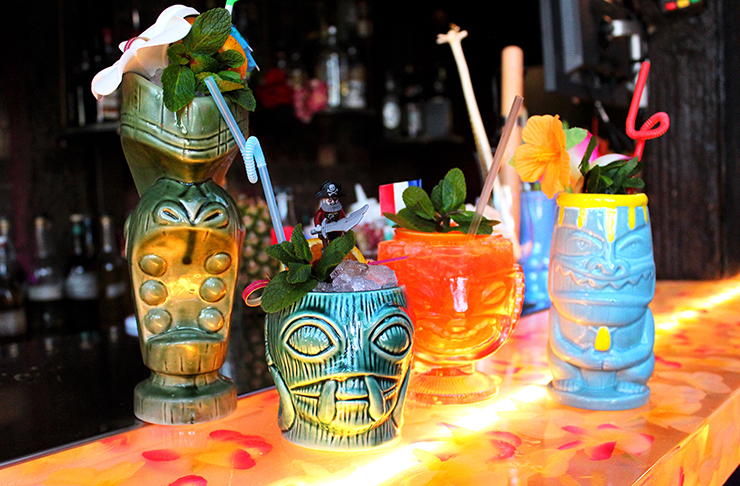 Kicking off the list with Talulah's infamous tiki cocktails. Your tropical holiday is closer than you think—and more alcoholic. Not ones to follow the rules, your best bet for a killer cocktail at Red Bar is to say ‘surprise me’—it's one of the best bars in Auckland for a stiff drink. We love us some heat, and Pocket Bar & Kitchen’s Bombay Blush is an absolute standout. Featuring names like jambavan, baloo and baku, you know Honeybear's cocktails are bomb. Try them all and pick your fave. Start your evening at Aura Seaside sippin' on one of the best cocktails in Auckland. Your night is now destined for success. The Gin Room are absolutely nailing reimagined classics and bringing originals to the table—AKA this peanut butter jelly time cocktail. Shuffle over, England, Fukuko’s Earl Grey Martini made with shochu infused tea is the shiz. Feeling a little fancy? The harikiri from Clooney is all class. How could you not feel fabulous with an SPQR Espresso Martini in hand? It’s one of the best cocktails in Auckland. My Bar’s menu is always a changin’, but their Rosebud will always be a firm favourite. Rally your cocktail loving homies and dive into a Polynesian Painkiller. All Bedford Soda & Liquor’s cocktails are next level, but this beauty is on fire—literally. Any cocktail shaken and strained with enthusiasm is a winner in our books. Start with Montage Bar’s Spicy Strawberry Martini cocktail before you tackle the rest of their menu. You may notice us singing praises for Orleans’ new Salted Caramel and Stolen Spiced Rum hardshake from here on out. It just landed and is already one of the best dessert-cocktail hybrids in Auckland. Mea Culpa’s cocktails are art in a glass. New cocktails are mixed up weekly, but you can’t go wrong with their Don Delicioso featuring chilli infused ginger liqueur. The Yuzu Sour from O’Connell Street Bistro uses Nikka Miyagikyo Japanese whisky, Yuzu, egg white, sugar and syrup. It brings all the feels. 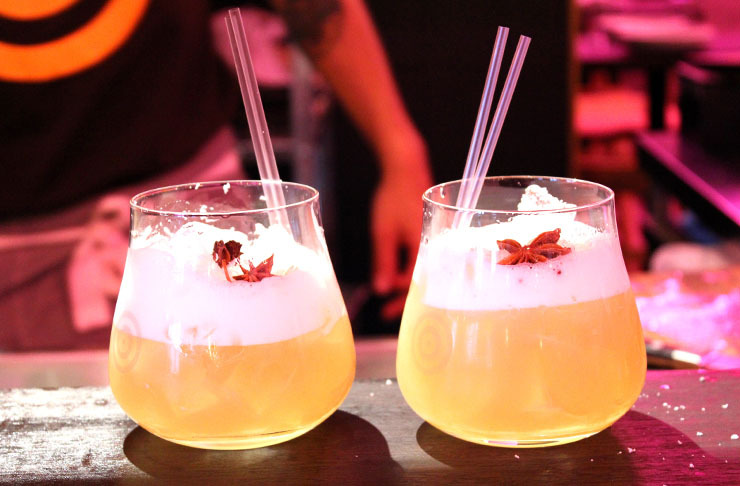 The Guilty Pleasure cocktail at Xuxu makes us go weak at the knees, with rum, mango, coconut, lime, and coriander. With cocktail champion Jason Rosen behind teh bar at The Parasol & Swing Company, whatever you choose is destined for deliciousness. Three words. Black. Plum. Daquiri. Bellini are pros at the cocktail-making game. Order the samurai cocktail—a light blend of sake lime and soda and the fresh fruit cocktail from The Gyoza Bar. The Gypsy Tea Room’s Bohemian Iced Tea. A cocktail in a teapot…’nuff said. MASU goes hundys on the mint in their classic mojito. It's refreshing as fook. Keeping up with the mojito theme, Madam Woo’s Ginger Mojito is the perfect drink to wash down a few infamous hawker rolls. The cocktails at The Britomart Country Club continue to impress us. The Black Forest features black rum, amaretto, lime, cranberry, raspberries, Aztec bitters and walnut butters. YUM. Dr Rudi's doesn't just have an epic bowling alley, they've got an epic array of cocktails to choose from. The Frisky Sailor has spiced rum and kombucha invovled—nuff said. Miss Moonshine’s serving up frozé all summmeeeer long. See you there. All Waiheke cocktail consumption should happen at Casita Miro. Rebujito is a crispy, zesty long drink of fino sherry, lemon syrup, and soda. The Manhattans are on point at Mo’s Bar. Strawberry shortcake? Well ok then. This cocktail at The Commons is outrageously good. 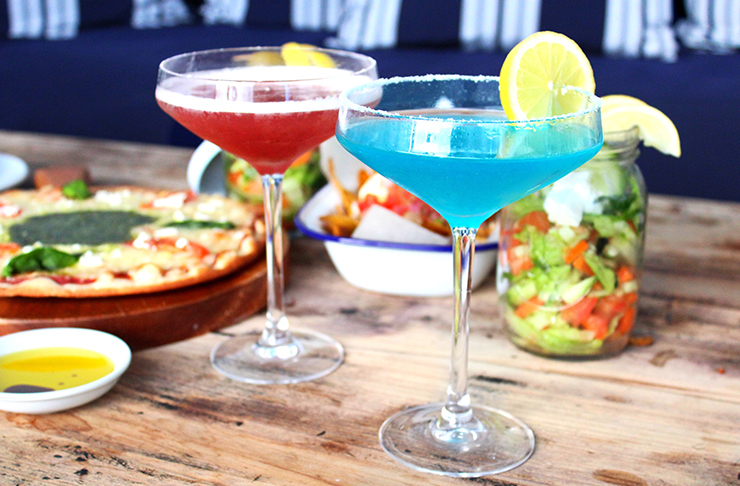 Martinis, shaken not stirred, are in their finest form at The Glass Goose. If you're at The Fed for a drink rather than the poutine, than give the Deli Mary a go. It's is a deliciously authentic take on a Bloody Mary. Every cocktail from 46 & York is worth it. They change the menu seasonal and we approve, every time. Wash down a creamy carbonara on a sunny afternoon with a Passionfruit Caipiroska at Prego. You'll fit in perfectly. Coco’s Cantina make one glorious Campari Spritzer. You'll be the envy of the bar with Scarlett Slimms & Lucky's epic Dark & Stormy. Go to Ebisu for the miso glazed eggplant, stay for the sake. The Garden Shed's carafe of Shed Sangria is the perfect drink to spin some yarns over with your bestie. The Limoncello Cello Mojito from NSP will give you all the Italian feels. Only one though, you party animal. Noone does drinks with a view quite like The Sugar Club. The Apple and Elderflower Peggy is our go-to. That Night In Havana at Soul Bar & Bistro is a gorgeous blend of dark rum, light rum, sherry, pineapple, coconut water and a dose of freshness from lime. A cocktail in a coconut! The Blue Breeze Inn’s coconut infused rum drink, Toolong A Lover is made for two. We love a good Pimms Cup from The Culpeper. Apparently it serves two? Oops. Cornerbar’s Slated Caramel Martini has a special place in our heart. A healthy cocktail exists. Cafe Hanoi's Matcha Do About Nothing boasts pineapple rum, black strap rum, coconut syrup, Monin Oregat and you guessed it... matcha tea powder. Sip on a Mango Gin Fizz— tropical mashup of gin, house-made mango and passionfruit soda, and lemon at Cassia. Soak up the holiday vibes with The Lula Inn's Island Time—Silver Rum, coconut, lime and sugar. Yas. The brainchild of Ada Coleman herself, Coley & Punch’s Hanky Panky is a spot on balance of bitter and sweet. Woodpecker Hill’s promises to deliver an appropriate punch of sour through their Whiskey cocktail. It’s one of the best cocktails in Auckland. Basically anything from Win-Win is liquid gold. Everybody’s pulls off a Basil Smash perfectly.